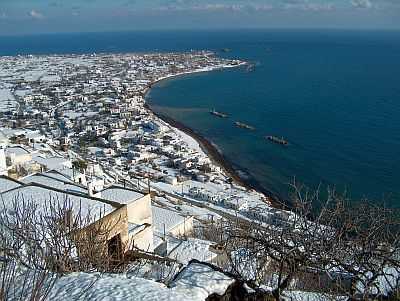 The climate of Skyros, the southernmost of the Sporades, is Mediterranean, with relatively mild and rainy winters and warm and sunny summers. 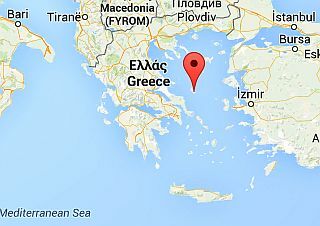 The island is not as warm as the southern Greek islands, it is windy, and in winter is subject to outbreaks of cold air from the Balkan Peninsula. Precipitation follows the Mediterranean pattern, so it is more frequent from November to March, and it's not abundant, since it does not reach 450 millimeters (17.5 inches) per year. In summer, the rains are very rare, and occur in the form of short downpour or thunderstorm. The southern part of the island is drier than the northern one, and has a particularly arid landscape. Winter, from December to mid-March, is not so mild: there are many days with highs below 10 °C (50 °F), and with a moderate or even strong wind. Furthermore, every so often, it can get very cold and it can even snow, although frosts almost never occur because of the influence of the sea. However, there are also mild periods, with highs around 15/18 °C (59/64 °F). The rains are quite frequent. Spring, from mid-March to May, is a pleasant season, mild and sunny, but some periods can be a bit cold, windy and rainy, which gradually become less frequent. Summer, from June to mid-September, is warm and sunny, with very few showers. Generally, the maximum temperature is below 30 °C (86 °F), and the prevailing wind, coming from the north, makes the temperature almost always acceptable. The Meltemi blows with a certain intensity in periods of a few days, but less than in the Cyclades. Very hot days are rare: occasionally, less than once a year, the temperature can exceed 35 °C (95 °F), as happened in July 2011, when it reached 37 °C (99 °F), and in July 1988, when it reached 38 °C (100 °F). Autumn, from mid-September to November, is pleasantly warm at first, then gradually becomes milder. The rains gradually become more frequent, although still in October there are long periods without rain. In November, the first days a bit cold and windy can occur, and sometimes also in October. 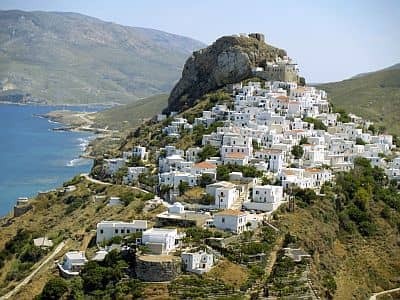 The amount of sunshine in Skyros is very good in summer, and also in May and September, when clear skies prevail, while in the rest of the year it's not so remarkable, since there are several cloudy periods. The temperature of the sea, still cold in May and cool in June, becomes acceptable for swimming from June to September, and reaches a peak in August of 24 °C (75 °F). The best time to go to Skyros for a beach holiday is summer, from June to mid-September. In June and September, and sometimes in early July, there can be some cool evenings, so it's better to bring a sweatshirt. If you want to go on excursions on the island, to visit the castle or the Byzantine monastery, or to climb Mount Olympus, 400 meters (1,300 feet) high, the summer temperatures are generally acceptable, in fact they are not too high, however, you can also go in May.